Many thanks to Kazembe Balagun, outreach coordinator at The Brecht Forum, for posting a note on Facebook with the actual reading list from “Afro-American Studies 198: The Black Man in the Cosmos” a course taught by Sun Ra in the spring of 1971 at UC-Berkeley (and the inspiration for the title of this blog). John Szwed’s wonderful biography Space is the Place: The Lives and Times of Sun Ra, is an impressive study of Sun Ra’s work (no small feat since Ra could be a difficult character to get a handle on). A good brief introduction to some of Sun Ra’s recording is this short guide written by Szwed in the Village Voice. John S. Wilson, Jazz: Where It Came From, Where It’s At. Count Volney, The Ruins, or, Meditation on the Revolutions of Empires, and the Law of Nature. P.D. Ouspensky, A New Model of the Universe. Frederick Bodmer, The Loom of Language: An Approach to the Mastery of Many Languages. 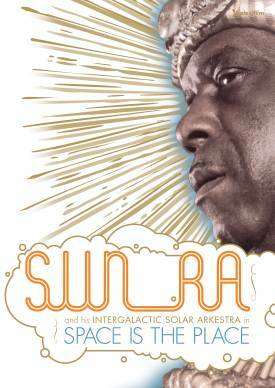 The collection Sun Ra: The Immeasurable Equation: The Poetry and Prose is an expensive and rare anthology. I’m saving up my pennies to get a copy at some point, but if you look at the Amazon and Google Books previews you can get a glimpse of what’s in it. Along with Ra’s prose and poetry there is also a bibliography of his book collection compiled by Arkestra member James Jacson and other scholars after Ra left the planet in 1993. Szwed’s biography gives a good portrait of Ra’s voracious reading habits and his insatiable thirst for books on music, history, religion, the occult, science, language and just about anything else he could get his hands on. I’ve been especially thinking about Sun Ra’s music this week what with the uprising going on in Egypt. Of course Egypt was near and dear to his heart and its ancient history was the source of the Arkestra’s mythology. Here’s a selection from an Arkestra concert in Egypt in 1983 with Salah Ragab and the Cairo Jazz Band. This entry was posted in Music, Sun Ra by Lavelle. Bookmark the permalink.